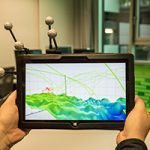 We are interested in the usage of spatial interaction with mobile devices for improved 3D visualizations. To contribute to a better understanding of this interaction style, we implemented example visualizations on a spatially-tracked tablet and investigated their usage and potential. Three-dimensional visualizations employing traditional input and output technologies have well-known limitations. Immersive technologies, natural interaction techniques, and recent developments in data physicalization may help to overcome these issues. In this context, we are specifically interested in the usage of spatial interaction with mobile devices for improved 3D visualizations. To contribute to a better understanding of this interaction style, we implemented example visualizations on a spatially-tracked tablet and investigated their usage and potential. 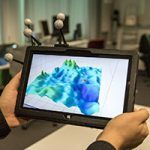 In this paper, we report on a qualitative study comparing spatial interaction with in-place 3D visualizations to classic touch interaction regarding typical visualization tasks: navigation of unknown datasets, comparison of individual data objects, and the understanding and memorization of structures in the data. We identify several distinct usage patterns and derive recommendations for using spatial interaction in 3D data visualization. Our prototype running on a tracked tablet that we used for the study. Height map used in the navigation task (NT). Bar chart used for the comparison task (CT). Scatterplot used in the structural understanding task (ST). Info The paper will be presented at the ACM ISS 2017 (Brighton, UK) in the paper session on Exploring Spaces: 3D Interaction. Our main interaction concept is to explore 3D visualizations situated at a fixed position by physically moving a mobile device through space, which presents a view into the data. Specifically, the location and orientation of the mobile is mapped to a virtual camera (see figure on the right side). For such systems, we would envision the users to employ physical navigation to get an overview and navigate between subsets of the data, as well as smaller scale spatial interaction supported by touch input to precisely investigate structures or specific data items. Users would freely move the handheld device to explore the visualization, to easily compare values at different viewpoints, and to filter or select specific data points with subsidiary touch interaction techniques. Visualization of selected camera trajectories of individual participants as line stripes. Color resembles movement speed (red = slow, green = fast). (a) NT with touch, using bird’s eye strategy, (b) a comparable strategy when using spatial interaction for the same task, (c) ST with touch, showing both the typical spherical patterns of the orbit camera model and the principal viewpoints selected by the participant, (d) similar patterns can be detected for spatial interaction.